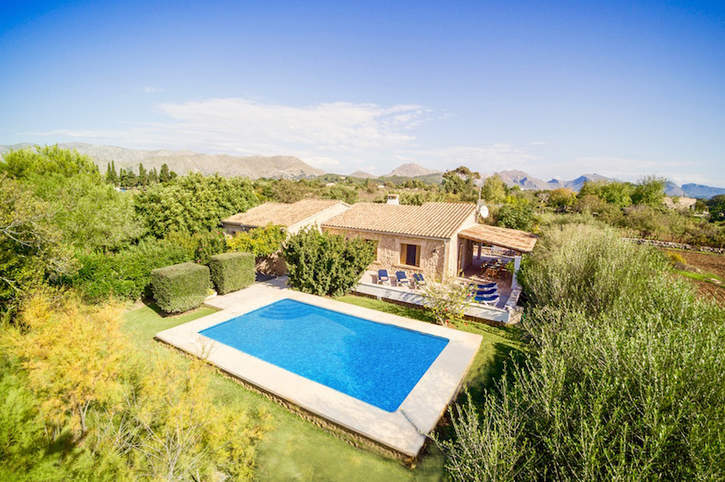 This traditional 3 bedroom villa invites you to enjoy the lush Pollensa countryside. Set on a generous plot and framed by a large, mature green garden, Villa Jordi Fiol has ample space for dining, lounging and spending your days outdoors. The charming open plan living space, a large wraparound terrace and a very inviting private pool provide the perfect setting for your Majorcan escape. Close to both Pollensa Old Town and the gorgeous beach and amenities of Puerto Pollensa, you won’t have to venture far for some local culture. WiFi and air conditioning/heating in all the bedrooms are included. Fantastic pool and gardens, wraparound terrace and a countryside setting - Jordi Fiol makes a top choice for outdoors lovers! The private pool and plenty of outdoor space are the stand out features of Villa Jordi Fiol. Cool off on the sun loungers or on the terrace, which spans 3 sides of the villa with 2 covered sides. Here you will find a delightful shaded spot to enjoy alfresco dining or a glass of local wine. You’ll also have a brick BBQ – ready and waiting for you! A pool fence is available on request at an extra cost of £60. Iron gates provide access to the driveway, with plenty of space for your hire car. A short stroll down the garden path leads you to the villa entrance, which is up two steps. Inside, you’ll find interiors in the traditional Majorcan style, featuring wooden beams, tiled ceilings and local ceramics. The living space and kitchen are open plan, flooded with natural light. The bright seating area surrounds an ornamental stone fireplace – perfect for retiring from the midday heat. Access to the wraparound terrace is provided by three different points, each providing different views out to the superb garden and countryside. All rooms are on the same level of the villa. The smart double bedroom comes complete with en suite shower room, while the 2 twin bedrooms share a separate shower room. All bedrooms have traditional furnishings, shutters on the windows, and have a bright and airy feel. In line with local energy saving initiatives, the villa has timed air conditioning on all units from 17.30 to 19.30 and from 22.00 to 09.00. Villa Jordi Fiol sits in the heart of the picturesque Pollensa countryside, a perfect spot to revel in the beauty of the surroundings. If you’re in need of a change of pace, head to the smart Puerto Pollensa, just 10 minutes’ drive away. Here you will find a chic marina, shops, restaurants and bars – there is also a huge sandy beach. 10 minutes’ drive in the opposite direction leads you to Pollensa Old Town, a Roman marvel with Gothic architecture and cobbled streets – a dreamy place to wander through come late afternoon. Our villas Cel and Figueres are nearby. Puerto Pollensa square is host to a small weekly market held every Wednesday. The market’s popularity means it now has a great range of goods on offer, from local produce and artisan trinkets, to children’s toys and jewellery. For a larger market, Pollensa Old Town hosts an atmospheric Sunday market where you can witness the locals in action, bartering for goods with local traders. For holiday essentials, there is also a local mini-market. All options are a 10 minute drive from the villa. The contemporary resort of Puerto Pollensa has heaps of bistros and cafes, with blissful views overlooking the boats in the harbour - you may spot fishermen bringing in their daily catch here. For traditional Spanish restaurants with some local flavour, try Pollensa Old Town. A little further away is the old Roman walled town of Alcudia, known for its ancient streets and charming towns. A visit there will take you around 20 minutes by car. Puerto Pollensa has a long, horseshoe shaped sandy beach. Gaze out towards the ocean or admire the dramatic backdrop of the Tramuntana mountains. Sunbeds and parasols are available to hire to keep that midday sun at bay. You’ll also find the Pine Walk promenade here, which is perfect for a stroll before a sunset cocktail. Down at the beach of Puerto Pollensa, children (and adults) can enjoy the thrilling array of amenities on offer, including pedaloes, banana boat rides and parasailing. If the high seas are calling, perhaps venture out from Puerto Pollensa marina on a glass bottomed boat. Additionally, you’ll find a host of water based activities in Alcudia, just 20 minutes’ drive away, such as the Hidropark waterpark. You could also try your hand at stand-up paddle boarding (SUP), but be prepared to fall in! Palma is the capital of Mallorca, and well worth the hour drive. Awash with culture, there are many historic sites to visit. We recommend La Seu Cathedral, a staggering gothic Roman Catholic structure, perched proudly above the water. Miro Mallorca is a gallery dedicated to the painter and sculptor Joan Miro – it is in fact housed in his former home. For something a little different, you might like to visit Petra, a sleepy rural town in the centre of Mallorca, birthplace of one of the Californian mission founders, Friar Juniper. You’ll reach Petra in around 40 minutes by car. The golf clubs of Pollensa and Aucanada are uniquely positioned with their stunning views of the coastline and are a must for all golf enthusiasts. Both are within 20 minutes’ drive from the villa and have club houses with restaurants - sip on a well deserved local glass of wine after a pleasant day on the green! Bird watching in the S'Albufera park, paragliding and hiking in the Tramuntanas are all available to try around the vicinity of the villa. For thrill seekers, kite surfing is also very popular along the northern coastline and there are many schools offering the experience. For those that prefer to be at sea, travel out to deep waters. You may be lucky enough to spot some of the native dolphins on your trip! Villa Jordi Fiol is not available to book for season as it is sold out. Take a look here at the Majorca villas that are currently on sale. Situated between Port d'Alcudia and Ca'n Picafort, S'Albufera is the largest and most important wetland region in the Balearics. It is a former lagoon separated from the sea by a belt of dunes. Flooded for most of the year, the reserve is an extraordinary place for observing a diverse range of bird life. There are quite a few different types of boat trips that sail off the local beaches to various destinations on the East coast including Starfish glass bottom boats, Dolphin Catamarans and Sea Rider speed boat trips.